Hansel Robles was bounced from last night’s game against the Phillies for “throwing at” Philadelphia catcher Cameron Rupp. That ejection was controversial because the ball clearly just got away from the fireballing right-hander, but he (along with manager Terry Collins) was ejected because both benches had been warned. 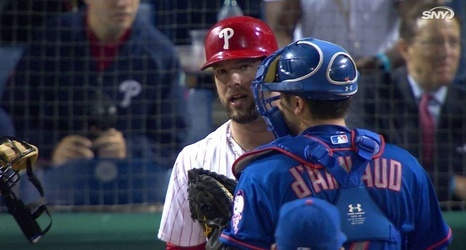 Yoenis Cespedes had been hit on the hand in the third by Justin De Fratus; Kirk Nieuwenhuis was hit by De Fratus’ replacement, Adam Loewen in the fifth; and Logan Verrett retaliated in the bottom of the fifth by hitting Odubel Herrera. When the ball got away from Robles and sailed past Rupp’s head on a 2-2 count (despite a sign from Travis d’Arnaud for a breaking pitch), Robles was toast. A total of 17 pitchers (9 Mets and 8 Phillies) were used; that’s not a record, not even for a September 30th game. Way back in 2007 on the same date, the Cardinals used 10 pitchers in a winning effort over the Pirates’ 8. The Mets could take tonight’s game; Sean Gilmartin will start with Tim Stauffer tapped to relieve him. Though Addison Reed and Tyler Clippard appeared last night, they should be available to relieve today. Philadelphia will start rookie Jerad Eickhoff. Thanks to a loss by the Dodgers to Mike Leake‘s two-hit complete game for the Giants, the Mets are one game closer to home field advantage. If the Mets win all 4 remaining games, they’ll clinch home field advantage; LA faces Tim Hudson in the last start of Hudson’s career tonight.